After reading my recent article about cooperating with your neighbors to share resources, my always-sharp wife Sarah made a great point. And she’s right. Here’s a picture of it. The play equipment above sits exactly on the property line with our neighbors to the south – the property line actually runs just to the right of the slide. The entire piece is used extensively by both families – we have a three year old and a one year old, whereas the neighbors to the south have a six year old and a four year old. This item was already in place on the property when we moved in – it came with the house. 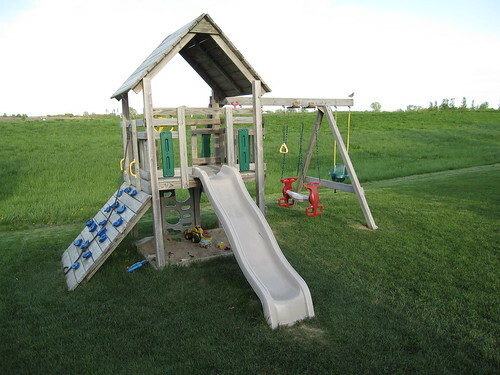 The previous owners of our home and the home to the south each wanted a large, wooden play area for their respective children, but instead they got together and made the frugal decision to split the cost of the play equipment. When we moved in, one of the first things we did was discuss the arrangement with our neighbors to the south. It turned out to be a great way to introduce ourselves to them and a great way to have our children begin to play with each other. According to them, they actually bought the very play set that they intended to buy for their children – they just paid half the price for it and got all of the use out of it. Later, when that family moved out, a new family moved in to the south of us. This provided them an opportunity to meet new neighbors (us) and have our children bond – and they certainly have. The younger child next door and our older son play together regularly and the older child next door loves “mothering” our toddler-aged daughter. What about liability? Whenever I discuss this arrangement, this is often the first question we’re asked. In this situation, house insurance would cover any claims that resulted from the equipment, just as if another child without health insurance was hurt while playing in our yard. In most practical situations, though, common sense and an ongoing, healthy relationship with our neighbor takes precedence – we’re all aware of a lack of any sort of ill intent with the equipment and the social costs of any sort of legal action in this situation would be tremendous. What are the potential benefits? As enumerated above, the play equipment itself saved each family 50% on the initial purchase (or it could allow for the families to combine resources to purchase an even better set of play equipment). It also reduced the work load on each family by half when the equipment was actually installed. After the purchase, it facilitated a better relationship between each pairing of neighbors that lived there – and also helped build a friendship between the children. What are the potential drawbacks? The drawbacks come if the situation changes. If one family moves out, the new family that moves in has to be agreeable to the situation or else you may have a legal problem (though most situations like this are resolved by common sense). Thankfully, two such moves have occurred since the equipment was installed without any problems. Another problem that may occur is if one family wants to do something different with the property line, such as installing a fence. Again, we’re fairly lucky in this regard – we have a large shared lawn area where the children of many families play together and most of the families are loathe to interrupt this with a fence or other obstruction. Yet, even in the face of these drawbacks, the shared play equipment has been an enormous win for us. Half the price, half the labor, all the enjoyment, and a built-in opportunity to bond with your neighbors. Sounds like a great deal for me!